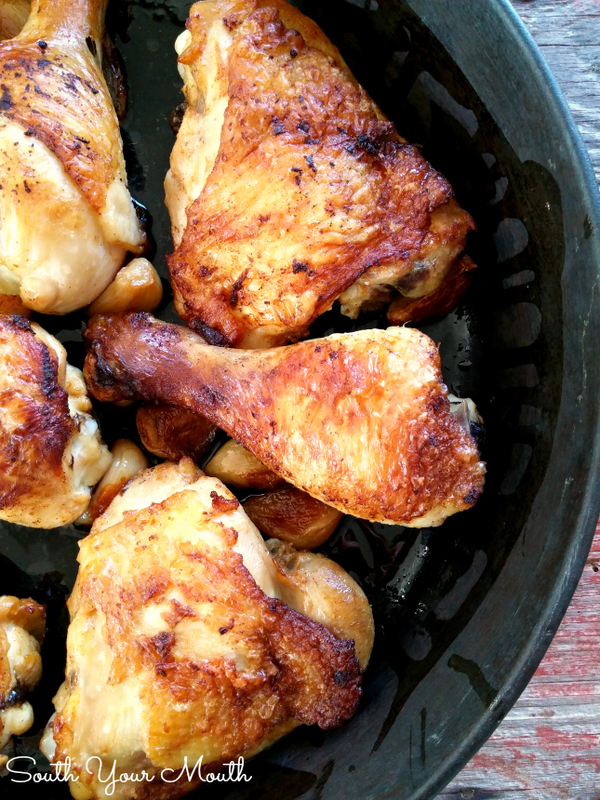 Beer brined chicken marinated with whole garlic cloves and simple spices roasted or grilled for super juicy chicken with incredible flavor that’s seasoned from the inside out! Have you heard of the recipe ‘Chicken with 40 Cloves of Garlic’? This recipe is a combination of that one and ‘Drunken Chicken’. You marinate the chicken in a beer brine with an entire bulb of garlic and the result is super juicy chicken with incredible flavor that’s seasoned from the inside out! Don’t worry, the chicken doesn’t taste like beer. Well, not like what you’d think anyway. You don’t take a bite and think, Well hello, Old Milwaukee! What you get is a hint of sweetness with an almost nutty undertone. The salt infuses the flavors of the garlic and spices into the chicken and helps it retain moisture throughout the cooking process. You could totally grill this but when you cook it like this, you cook the garlic too which yields these golden little gems of roasted garlic that you scan schmear on a nice hunk of crusty bread or do like I did and toss it with some roasted cauliflower. OMG! So good!! Note about the photos: These aren’t the best. I let the chicken sit out too long before I photographed it (long story!) so this almost looks a little dry. Trust me, it’s not! Even after this sat out, got covered in foil, sat out some more while I roasted some cauliflower then got put back in the oven to reheat, it was still insanely moist and juicy and delicious and I already want more! Of course, if I were a professional food photographer and blogger, I could have sprayed it with WD-40 or hairspray but we actually eat the food I share with you here. If I was a real pro this blog could be so much better in so many ways but I’m no pro. I’m a regular mom with a regular job taking regular pictures of my regular supper right before we actually sit down and eat it. Separate garlic cloves from the papery bulb then peel each clove. I made quick work of peeling mine by placing them all in a quart-sized mason jar, screwing on the lid and shaking vigorously until all the peel fell off. Slightly pop open each clove by laying your knife over the clove and gently pounding with the heel of your hand. You don’t want to obliterate them like you would if you were going to mince the garlic. You just want to open each clove up a little to release the flavor. Combine beer, garlic cloves, salt, garlic powder, paprika and white pepper in a gallon-sized zip-top bag or large dish then stir until the salt is dissolved. Add chicken, seal or cover, then refrigerate for 24 hours. Drain chicken well, reserving garlic cloves. Heat a large cast iron skillet (see below for alternate preparation also) over medium heat. Add just enough vegetable oil to skillet to coat the bottom. Once oil and pan are hot, add chicken pieces, skin-side down. Cook chicken on all sides until browned. We’re not trying to cook the chicken through, just brown it nicely. 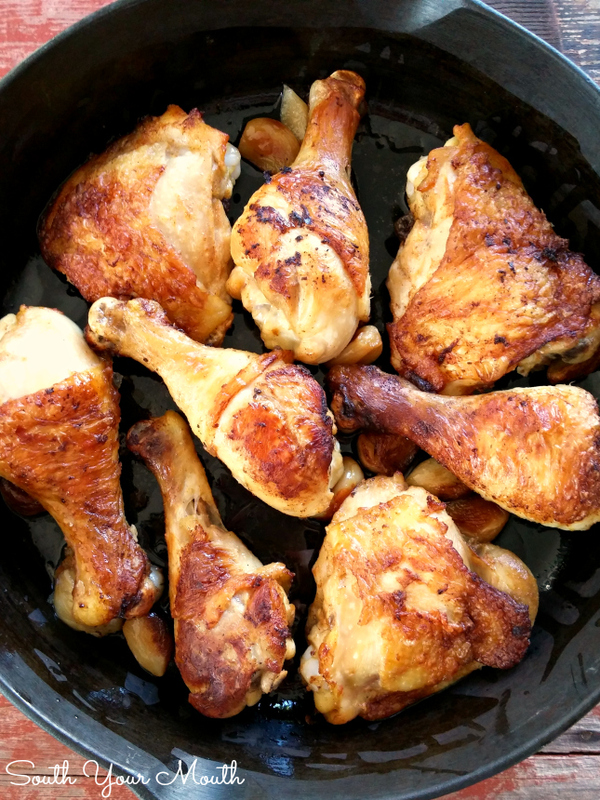 Once all chicken pieces are browned, position thighs skin-side up and place reserved garlic cloves around chicken. Place skillet in the oven and bake at 350 degrees for 40-50 minutes or until deep golden brown. Remove skillet from oven and cover loosely with aluminum foil. Rest dish for 15 minutes then serve. Don’t throw out the garlic! You can eat it, spread on bread or mix with roasted vegetables. 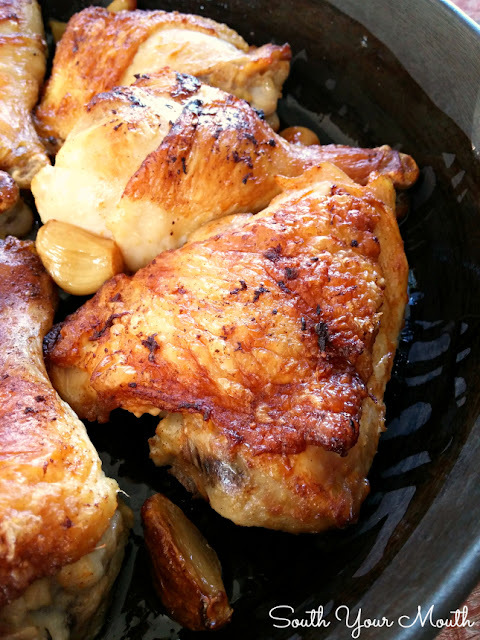 If you don’t have a cast iron skillet or a frying pan big enough to fit all the chicken pieces, don’t worry! 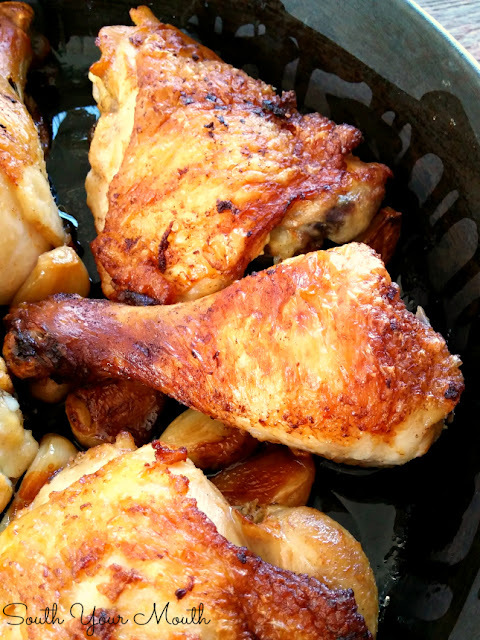 Just brown the chicken in batches in any sturdy skillet. Spoon a little of the pan drippings into a 13x9 baking dish to grease the bottom then transfer chicken and garlic to dish then bake per recipe. You can get away with marinating the chicken less than 24 hours but I wouldn’t go less than 12 hours. Do not use boneless, skinless chicken. I don’t recommend using chicken breasts. If you try it anyway, don’t yell at me if your chicken is dry. You can absolutely double this recipe (actually I usually do). Double all ingredients (2 bottles of beer, 2 bulbs of garlic, etc.) and cook the same amount of time. Use any beer you like. I’d recommend a brown ale or lager and would probably steer away from IPAs or other super-hoppy beer. ‘Drunken Chicken’ is the name given to several different ways of preparing chicken using alcoholic beverages. Have you tried this with chicken breasts? This sounds wonderful but my husband doesn't like dark meat. I love this. And I enjoyed your blog about eating what you photograph. I do the same. But sometimes I wonder if I'll ever have hot food again! Thanks for sharing. I think your photos look great, and I can't wait to try this out! And thanks for your tip for peeling garlic - that's going to come in handy! I don't know why people have such a difficult time peeling garlic. I just take my heavy glass salt shaker and smash it down on the garlic clove. Voila--skin comes right off. I love you and I love your blog! You do a GREAT job here. I only had 8 hours for marination. It turned out SO GOOD. This is a fantastic recipe! Thank you for sharing!